Inspired by blogger Money Honey, who consistently make donation to charity and had Permanent stock holdings for Self-funding donations via dividend collected, I decided to make my first donation in 2015. I started regular monthly donations more than 15 years ago. Please do not *Wah! * It was only S$2 a month to NKF. Unfortunately, the money donated since (computed as >S$360), until today is not sufficient to pay for the bathroom tap of the unethical T.T. Durai, ex NKF CEO imprisoned for corruption charges. Below is my S$50 donation to Singapore Association of the Visually Handicapped. I always think that being not able to see is one of the cruelest things that can happen to a person. This is one reason why I started with SAVH to donate. While it is not a lot of money, it is a token from my heart, and a good start in 2015. And yes, this is one of the things that break my comfort zone too. Something I mentioned in my earlier post Good Bye 2014, Hello 2015! We are waiting n r u ready? That gold tap incident scarred many donors heart. But time to move on now. $2 is small amount but it is still your sweat money; also, every little amount matters. You are indeed a kind person. Yes, TT Durai incident is just minority. We should move on & never condemn charity org. Even if there is Durai no.2 or 3, we should not worry bcos 善有善报，恶有恶报，不是不报，时候未到，时候一到，一切全报。Your kindness influenced me, hopefully my donation can influence others n spread on. May I know how u decide on which charity org to donate? So many, when u go to the website. I random pick on charity org to donate. Well done, Rolf. May your donation comes back in bountiful returns from the market. Huat ah! Haha. Hope so! Apparently there is already small return bcos donations can have tax rebate. Money donation never as kind as physical assistance to those who need help. Hi Rolf. Thumbs up to you, that's what I call a good start to 2015! Oh ya.. That's correct! Donated off our cpf and some. Just checked that this year donation will vary according to monthly salary. Monthly CDAC is force force deducted from our salaries. A good start for the year! i also just donated RM63 to buy tin biscuit for malaysia flood victims. money can always has better value for those really need it. Tin biscuit with all your money inside instead of biscuits. Haha. I like your statement "money can always has better value for those really need it." So true. Oh no... Just realize about the flood news. Nice start for the year, Rolf. I rotate charities annually though cos I can't give to all charities in mind so "circulating" my donation each year. Last year was the bone marrow org. This year, shall go for charities connecting to old folks and dementia. Your donation may not be huge but it's your thought and sincerity. Keep up with this great feelings. That is a good way. Rotation. Actually I was thinking of the same way. Bone marrow and old folks and dementia seems like good one. My mother in law many years back, switch from factory to work in old folks home to help the old people. It was tough, but she felt rewarding. Let's continue the good feelings. 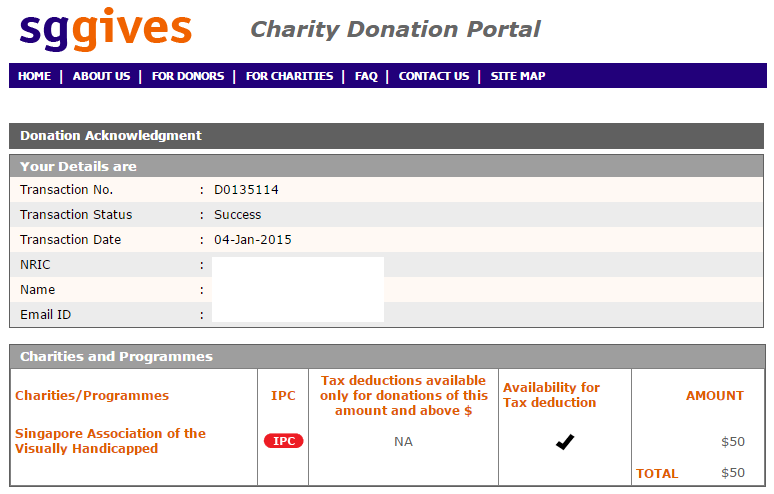 Indeed a good start to 2015 and we should always donate to a good cause if we can. I will also making a donation soon, most likely to an old folk home. It's better to do good while we still can. One day, we will be old too. My father died when I was young, and my godfather uncle passed away last year. I always thought I will be strong and not cry, but still I couldn't control my tears at the wake.